Day 2- Nairobi / Lake Elementeita: Breakfast at your hotel. Check out and enjoy a leisurely drive (around 2 hours) in a customized 4 x 4 safari jeep to the shores of Lake Elmenteita. En route, you will have a photographic stop over as you drive down the floor of the Great Rift Valley, to enjoy the breathtaking scenes of this geographical phenomenon that stretches all the way from Lebanon to Mozambique (Northern to Southern Africa) covering over 9,000 Kilometres. Proceed to your luxury tented camp, situated on the shoreline of the Sapphire blue Lake Elmenteita. Check in followed by lunch. This afternoon, you may just rest or enjoy game drives in the Soysambu Wildlife Conservancy. Dinner and overnight at Serena Lake Elmenteita Luxury Camp. Day 3- Lake Nakuru National Park: This day, you will enjoy either a morning or afternoon game drive at the nearby Lake Nakuru National Park, a world heritage site, bird watcher’s paradise and a safe haven for the rare White Rhinos and Rothschild’s Giraffes. The park is also home to all members of the Big 5 except Elephants and hundreds of bird species. Rest of the day will be at leisure at your tented camp. All meals and overnight at Serena Lake Elmenteita Luxury Camp. Day 4- Elementeita / Masai Mara North Conservancy: Breakfast at your camp. Check out and drive back to Nairobi for a morning flight out of Wilson Airport to Mara north conservancy. Arrival after about 50 minutes and met at the local airstrip and transferred in a 4 x 4 game drive vehicle to your tented camp with game viewing en route. Check in followed by lunch. This evening, you will enjoy shared game viewing activities as per camp’s schedule. Dinner and overnight at Karen Blixen Camp. Day 5 Masai Mara: Early morning and late afternoon shared game drives in search of the BIG 5; Lion, Buffalo, Elephant, Rhino, and Leopard and several other animals including Impalas, Gazelles, Wildebeests, Hyenas, Topis, Zebras, Giraffes and over 450 bird species are resident to this world-famous reserve. 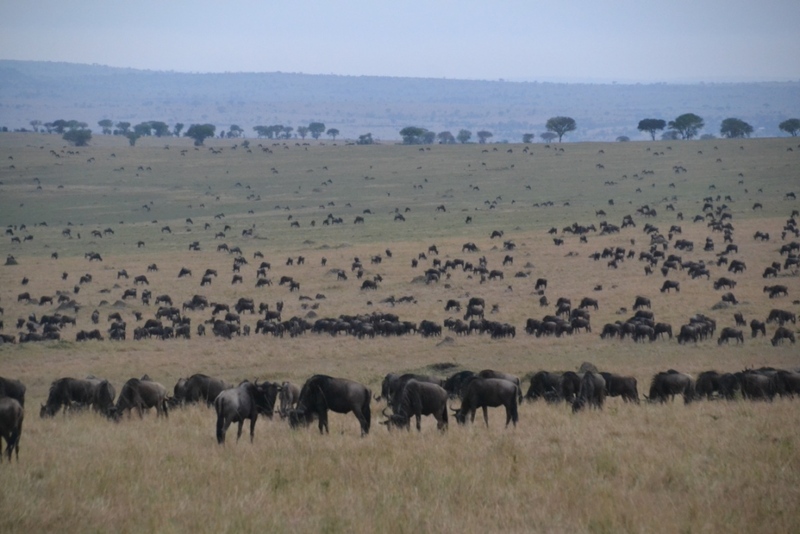 The annual Wildebeests Migration from Serengeti to Masai Mara also takes place here between July and October when millions of Wildebeests and Zebras closely trailed by the Big Cats cross the Mara River and roam the reserve’s plains in search of greener pastures. Masai Mara offers that natural setting to get up close with the pristine African wilderness and you may also try a Hot Air Balloon or visit a Masai Village during your stay. Rest of the time at leisure in your tented camp where you may just rest of enjoy a swim. All meals and overnight stay at Karen Blixen Camp. Day 6 – Depart: Breakfast will be served from 0630 hrs. Check out and enjoy a game drive enroute to the airstrip for your scheduled morning flight back to Nairobi. Arrive at Wilson Airport at around 1200 hrs, Met and proceed for Farewell lunch to be served at the Carnivore Restaurant /similar and we will then transfer you to the Jomo Kenyatta International Airport for your evening / night onward flight. *Additional sightseeing or deviation from the itinerary, all items of personal nature such as tobacco; mosquito repellents, laundry, drinks/beverages; phone calls, etc., Tip for guides, porters,waiters, Medical/Travel Insurance, Festive season supplements, All International Flights, Kenya Entrance Visa (USD 50 per person), Any Other Items not in the inclusions list above.